In this paper, our newly proposed Nash-EGO algorithm is applied to real large-scale airfoil/wing optimizations. A finite wing is represented by mounting control airfoils parameterized with a set of design variables, which are manipulated to be increased gradually in purpose of enriching the searching space to accommodate possible more optimal solutions. The enriched design territory is technically split into small subsets to be assigned to the players of Nash-EGO. Doing this way, the performance of each efficient global optimization (EGO) player could be expected to keep at a high level due to EGO players now take care of only their own small-scale subsets instead of facing the large-scale problem directly. The algorithm is first applied to a constrained drag minimization of RAE 2822 airfoil with 14 to 54 design variables and two to eight Nash players to investigate the performance of Nash-EGO, particularly for having an understanding of the influences of the numbers of design variables and Nash players. Then, more challenging cases, sectional shape optimizations of DLR-F4 wing with up to 84 design variables, are conducted. The results show that, in comparison with the baselines, up to 47.5% drag reductions can be achieved by Nash-EGO optimizer; meanwhile, the CPU costs are greatly reduced (up to 366.8% speedup) as compared with the counterpart of the traditional EGO. 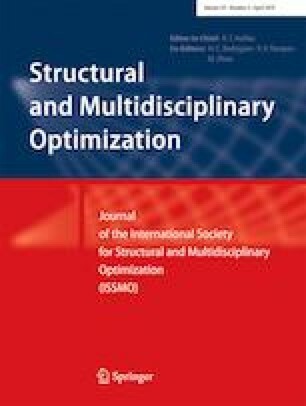 The successful applications presented show the capability of Nash-EGO algorithm for solving real engineering optimizations with large scales. This work was partially supported by the National Natural Science Foundation of China (Grant No. 11172134) and the Foundation of “Jiangsu Innovation Program for Graduate Education” (Grant No. KYLX_0218). The authors would like to thank the anonymous reviewers for their helpful comments.